When your controller is first powered on it will run a short wizard to connect your controller to your wireless router. If you’re not using the initial startup wizard then go to the section Viewing Wireless Settings to change your wireless settings. Select your wireless network from the list shown on the controller display and press the Confirm button on screen. If your network is not listed then check that the unit is within wireless range. Enter your wireless password and press the OK button on keyboard. Make sure you press the OK button after you’ve entered your password. Pressing the Home or Back buttons will not save your changes. When connecting to your wireless, the WiFi Icon at the bottom right of the controller screen will flash. Connecting takes about 30 seconds and when successfully connected the WiFi Icon will stop flashing and stay on. 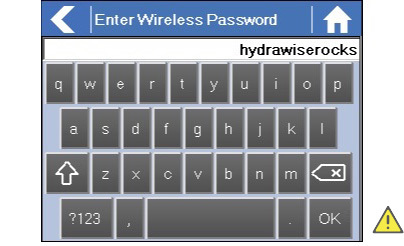 To successfully connect the Hydrawise unit to your wireless router you will need to correctly select your wireless router, wireless security mode and enter your wireless password. The current status of the controller’s connection to your wireless router is shown at the top of the screen. The controller will automatically attempt to connect to the configured access point if a connection is lost (for example, after power failure). Touch on any of the green buttons to change the wireless type, security type or password. Touching on the currently configured Wireless Name will automatically start a scan of all local wireless routers and allow you to choose a new one. After about 5 seconds a list of found wireless networks will be listed. To select a wireless name, touch on the wireless name and then touch Confirm. Do not press the Home or Back buttons after selecting your wireless router name – these options will not save your router name. Each time you touch a wireless name the signal strength will be shown at the bottom of the screen. Your Hydrawise controller is within range of your wireless. Your access point is configured to accept connections from 802.11b/g wireless clients. If your wireless router is hidden you may manually enter it by selecting Manually enter wireless and typing in the name. The security type configured on the controller must match the security type configured in your wireless router. The Hydrawise unit can attempt to automatically detect this if you choose Auto Detect as the security type. After choosing the security type press the Confirm button. For any security mode (except for Open) your wireless router password must be entered. Wireless passwords are a minimum of 8 characters and are case sensitive. After typing in your password press the OK button. Do not press the Home or Back buttons – these options will not save your password. The controller will show different status messages whilst connecting to your wireless router. Looking for Wireless... Controller is currently scanning for local wireless networks. Connecting to... Controller is currently trying to connect to your wireless router. Waiting for IP Controller has connected to your wireless router and is waiting for your wireless router to give it an IP address. Your wireless router must be configured as a DHCP server. Connected All is good. Controller has successfully connected to your wireless router. Local Connection Only Controller is acting as a local wireless router. 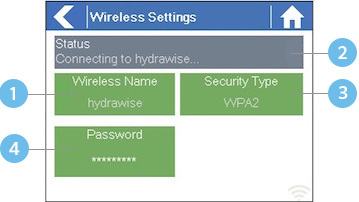 This video shows how to setup the HC Hydrawise compatible controller with Wi-Fi. Hunter’s new Wi-Fi-enabled HC irrigation controller allows for efficient management of all job sites from a smart device, home or office computer through Hydrawise web-based software. The HC controller is offered in either 6 or 12 station fixed indoor units, which can be increased to 36 stations with the 12 station expansion modules.